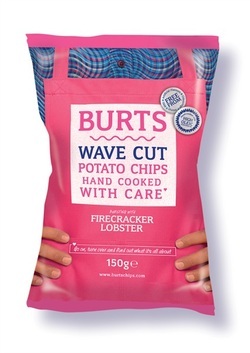 Burts did have plain flavour colour coded bags just like market leaders, Kettle Brand. The update is among the best Crisp bags designs we have seen. Each flavour has a different coloured apron and each cook, standing with hands on hips, has a matching shirt. The brand name is nicely sized, and although we would prefer the all important flavour was given more prominence, this design is as good as any. After grabbing the largest Crisp in the bag, we were surprised that it took a staggering 21 seconds from first crunch to swallow. They were thick and crispy, which is rare. Usually, with Wavy and thicker cut hand cooked Crisps, the crunch is a little meaty and soft, but the hardened oil sustained a significant, but dull sounding crunch. These Relatively thick Crisps included medium sized Ridges. They looked a little transparent due to a very oily texture. There were a few oil bubbles but not many. It was mostly all about the Ripples and the seasoning harbouring inside them. This provided a dark orange glow with tiny flecks of green dotted about. A Nose Plunge Test featured a very feint peppery spice aroma. The flavour was much anticipated. You don't get Crisps with much more exotic and sounding names as Firecracker Lobster. There was certainly a mild spicy addition to the oily potato, but maybe because Lobster has not got a particularly memorable flavour in itself, the exoticism remained with the name rather than the flavour.